It is easy lose sight of the difference between margins and sales. Many businesses talk in terms of the sales they make. 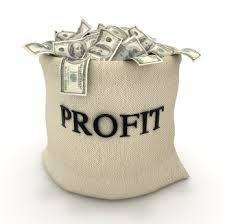 But the figure you should really be interested in is the volume of Gross Profits your business delivers. The Gross Profit Margin you make over the cost of providing a product or service (the Cost of Sales) is the money left to contribute to pay overheads (relatively fixed), and then when you have covered those, becomes your profits. Let’s take bad debts first. Of course, this does not apply to you if you get cash payments on delivery, or better still, payment before delivery. However, a significant proportion of small businesses invoice their clients on delivery of the product of the service. Your Terms of Trade may vary anywhere between 7 days to 6o days. I’m talking about when you require payment, not when you actually get paid. Unfortunately, we often find that the bigger the client, the slower the payment. What happens when you have a bad debt? Say your sale was $1,000 and your Gross Margin was 35% ($350). The sale goes bad for whatever reason, and the client does not pay. It is easy to assumethat you all you have to do is make another sale of $1,000 to recover your position. Easy to assume, but wrong! To recover that $1,000, you have to make enough profit to get the sales value back, because a significant proportion of the new sale will be, as before, the Cost of Sales – the cost of providing goods or service. And that amount we can calculate by dividing the sales figure ($1,000) by the Gross Margin (35%). And that gives the princely sum of $2,857, and that’s without the cost and effort of achieving the new sale. It makes sense to set yourself up so that this situation does not arise. Policies and procedures help, as does getting paid up front, or at least a reasonable down payment. In these days of multiple credit cards, securing a credit card imprint can be useful. In other words, get the client or someone else to cover the debt. You are not in the banking business. And so to promotional campaigns. Much the same situation applies, except that it is harder to measure. If you do decide to calculate return on a marketing campaign: when comparing cost to returns, "returns" should be your profit, not your gross sales. If you spend $1,000 on a marketing effort and generate $1,000 in sales, you are losing money; you are out the direct cost of product or services that you sold for $1,000. And you have no contribution to other overheads. You have only broken even on a marketing campaign that costs $1,000 when you have sold enough product or services to generate a $1,000 PROFIT. How much sales that requires depends completely on your products, and your profit margin. There is a further complication! Your business will undoubtedly have a number of product/service lines. I’m sure you know the sales each generates, but do you know their profitability? In nearly thirty years of working with small businesses, the biggest problem I’ve found hindering their prosperity and growth is not knowing what is going on in their business, where the money was being made, or lost. What hinders, and what helps? So often the profitability of one or two lines is masking the lack of profitability of others. Here are a couple of articles you might find useful. Are you inflicting failure on your business? When clients approach me for coaching, clients with businesses that are underperforming despite the crippling hours and effort the owner is putting into them, they are sometimes held back by lack of knowledge of what is happening in their business. A lack of focus of potential improvements leads to a lack of control over their business, and eight times out of ten that lack of control comes down to a lack of knowledge of what is happening in the business, and what their peers are achieving. For more than 29 years I’ve been helping small business owners plug the profit leaks in their business and restoring their cash flows by assisting them understand where and how they may change their business to be a leader in profitability, productivity, and competitive advantage. Do Tenders or Quotations form an Important or perhaps a Major Part of Your Income? If so, do you measure the number of tenders and quotations you submit, and the proportion that you win. Both figures are important Key Performance Indicators (KPIs) of your future cash flow. Changes in the number of tenders or quotes you have the opportunity to submit may indicate changes in your market place. If they start to trend down – why, what is happening out there? Have you earned some black-marks, or is the market turning down? Do you target to win a certain percentage of tenders and quotes you submit – 10%, 20%, 33%, 50%? What proportion do you actually win, and what is the trend? If you are not winning “your share” is it because the competition is getting stronger, or are you doing something not quite right? Whatever the reason, improving your tendering or quotation writing skills can significantly improve your business results. There is money in tenders. The NSW Government alone spends $12.7 billion annually procuring goods and services. At the other end of the scale the NT Government is the major buyer in the Northern Territory, procuring over $800 million in goods and services each year. NT Research found that whilst the tender process for goods and services under $50,000 represented just 2% of the total value of tenders awarded, they comprised 47% of the total volume of tenders. How do you respond to all the requirements? How do you answer the criteria? How do you layout and format the response? How do you clearly show, on paper, why you are the only logical choice for the contract? And how do you do all this on top of your other workload? Just to avoid rejection in the first cut, a tender must be compliant and answer every single requirement. To go on to win, it must also be competitive and persuasive - it must show, clearly and persuasively, your difference, why you rather than the competition should get the contract. And the margin between winning and losing is very often only a few points. Rigorous analysis of the requirement – do you do this, or do you just jump in? Attention to detail – many skip the details because they are ‘too hard’, or they just don’t see them. Developing processes to identify and pursue key tendering opportunities, including those not advertised. You need to avoid a situation whereby your final proposal is bidder-centric. In other words, you have placed your solution at the heart of the bid. From the client’s perspective, these bids tend to come across as ME-ME-ME. A more successful approach is to place the client ‘smack dab in the middle’ of your response. Everything has to revolve around their needs, which, of course, is the way it should be. Client-centric proposals make the client feel that the tender is written for them in person; not written down at them. Successful proposals place the emphasis on the client’s needs rather than on your abilities, technology, or experience, regardless of their technical merit. Novice proposal writers tend to hype their own products/services and relegate the client’s needs to second place. Responding to tenders need not be a complex, stressful burden, nor costly and demanding. I’ve been running workshops and coaching businesses for many years on helping them improve their tender submissions. There are a number of testimonials on my website supporting the success I have had (www.catalystnt.com.au). I’m developing an online course (TenderWins) to help businesses improve their success in tendering to governments and reduce the stress and time in preparing government tenders. You will understand how to prepare for, analyse and persuasively respond to tender requirements. Winning more tenders will take the stress out of your life. It is better to stop something bad from happening than it is to deal with it after it has happened. And so it is with business failure. If you know there are problems coming up in your business, you can do something about them. That is a much simpler and cleaner solution than trying to tidy up the mess of a failed business. I know – a long time ago I had to step in and try and save the family business. It was very disheartening to hear the Bank Manager say, “You’re doing everything right, but you are two years to late!” 118 years of trading down the gurgler, and a mess it was. Partly it was due to a business model whose time had passed, but it also was a lack of the right information. You need to see the threats coming to your business to take evasive action. That means illuminating the possible problems and creating insight into your business with good financial, productivity, efficiency and risk information. Without good records that can’t be done, but there is one more imperative. Unused information is of no benefit. It must be analysed to determine what is happening in the business, what are the trends, what are the warning signs, are you looking for the danger signals. To see the threats, and the opportunities you must analyse the information. Business failure is often self-inflicted. Having analysed the information. it needs to be documented. Reports must be written. It is only in actually writing the reports are owners and management likely to consider the implications of their information. You know that yourself. Simply looking at a set of accounts, customer conversion rates and all your other KPIs does not make allow proper consideration. It gets put aside while you get on with the next thing. Having to write up the reports provides that consideration. That is why I require my clients to develop a reporting template and write their report regularly. We meet to discuss their findings when I’m mentoring or coaching them. So many "business" owners simply have a very low paying job because they don’t take this basic step. Many initially regard reporting as a pain in the posterior, but as they grow in their business and develop their understanding of their role as a manager and entrepreneur, and not just the Supreme Technician in their business, they embrace the concept. Many studies on why small businesses fail attribute failure to things such as an inability to manage costs, inefficient ineffective and inexperienced business management, poorly designed business models or no business plan, insufficient capital, poor or insufficient marketing, failure to seek professional advice. And these are certainly factors. In one study, 70% trusted their "gut instinct" over any professional advice. It is all very well to trust your gut instinct in your area of technical expertise, but less sound in an area in which you don’t have experience. The Australian Securities and Investments Commission said in 2011 that too much failure is self-inflicted. In fact, “poor economic conditions” was not at the top of 13 possible causes of business failure across five industries on which ASIC reported. “Poor financial control including lack of records” and “poor strategic management of business” came much higher as causes of business failure in the construction, services, retail, accommodation and food, and manufacturing industries. This reference to ‘poor financial control’ is important. Despite the fact that I found only one other reference nominating insufficient time managing the books as an important factor, lack of visibility is a crucial factor. But it is not just financial information that needs reporting on. It is all the other factors whose outcomes are reflected in the financial information; productivity, efficiency, markets, risk. I find it passingly strange that, in discussions of why business fail while all the usual reasons are paraded; lack of a business plan, lack of finance, lack of management skills, lack of a market, or marketing, poor business models and so on, little weight seems to be given to measuring what was pivotal in their business. And those who don't measure, also don't analyse and report. Making good decisions requires good information, then analysing and using that information. 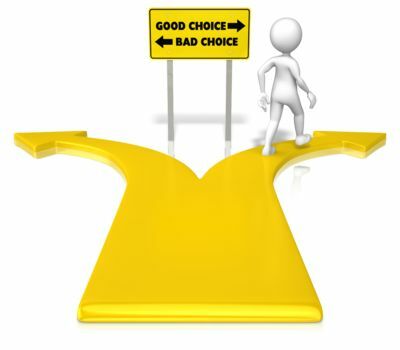 Making decisions on gut feeling and instincts is all very well, but you are far less likely to make the right decisions. Facts require a good information system providing accurate and timely information. People are likely to make poor decisions without accurate and timely information that has been analysed and reported. And too many poor decisions will lead to business failure. Experience has taught me that a business owner or manager must have accurate information upon which to make decisions. That means having the right KPIs for your business, and they must be analysed and handled correctly for any small business to not just survive but be profitable and provide you with the freedom you deserve. Nearly 40 percent of every company is unprofitable… by any measure. 20 to 30 percent of every company is so profitable that it provides all the reported earnings — and subsidizes the losses — of the entire business. Most current business metrics and control systems (budgets, etc.) do not even show the problem, or the opportunity for improvement. Most of the unprofitable and marginal business can be turned around using the three key elements of profitability management: profit mapping, profit levers, and a profitability management process. This can only happen if these businesses are not measuring the right things, and reporting on them. Have a business. 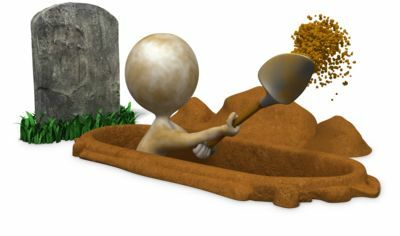 Don’t self-inflict failure and dig your own grave. When clients approach me for coaching, clients with businesses that are underperforming despite the crippling hours and effort the owner is putting into them, they are sometimes held back by lack of knowledge of what is happening in their business. A lack of focus of potential improvements leads to a lack of control over their business, and eight times out of ten that lack of control comes down to a lack of knowledge of what is happening in the business, and what their peers are achieving. Beware the Thieves of Time! Just think about that; he’s got problems, problems that are holding him back, problems which if he could remove would lead to success. But he couldn’t convince himself to do something about them. He was like a hamster on a wheel; running fast, going nowhere! Problems are a time trap. They eat up your available time, time you could use to do more profitable things for your business. And they cause stress; you end up spending more and more time at work, and less time with family, and doing the things you enjoy. Is there a way out of this maze? Recently I came across an article by Hunter Leonard of Blue Frog Marketing “Time is a Tender Trap”. In it, Hunter offers some simple, but very effective tips for you to avoid falling into a “Time Trap”. In this article, I’m going to share with you some very important tips on the use of time as a business owner. 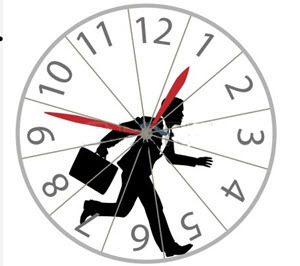 In our experience working with business owners ‘time management’ is often the biggest issue they run into. But it isn’t necessarily about ‘time management’; it’s about ‘time investment’. I’m exactly like you and can share that, I’ve had times when time was my worst enemy and times when it’s been my best friend. But if you feel trapped by a lack of time; it’s not fun. Probably one of the most important things you can do is to learn to say no to the thieves of time. In my business, marketing advisory, I get a lot of people reaching out who want to ‘have a coffee’ with me to ‘get some advice’ on their marketing. I have found they are rarely high-value prospects, and unwilling to then move from a chat to a paid engagement on their marketing strategy. I also get a lot of radio and TV media salespeople who want to ‘drop in’ with their latest ratings and ideas. I found these a waste of my productive time, so I say no to most meetings of this sort. And I engaged a media buyer to be the go-between with all other media. Easy to say, right? But not easy to do. I find the absolute best way to prioritise the important stuff is a process called ‘Big Rocks’, I’m sure you’ve heard about it. Mentioned in Steven Covey’s, "7 Habits of Successful People"; referencing an old professor of his if I’m not mistaken. ‘Big Rocks’ represent the things that are important to do, and important to you. The way I do this is to schedule in time in my diary for ‘Big Rocks’ each week first. Then I find I have less available time to do other non-valuable stuff. And guess what; it doesn’t matter if it doesn’t get done. But if you don’t make the time, other things will creep in and push out the ‘Big Rocks’. The number of times I talk with business owners who are running around busy and say, “I just don’t get time for strategy or planning.” That’s just a cop-out; make time for the important things. You used to have to put on a part-time or full-time staff member to take things off your desk, but these days with online ‘tasking’ sites and off-shoring and other options you can have a very flexible approach to outsource the ‘knucklehead’ stuff off your desk. You must put a value on your time as the business owner. And as much as possible, don’t do the low-value stuff, if it is stopping you getting to the high-value stuff. I understand you may have limited budgets, but to expand and be a successful business owner you have to do the important things. I use a free online time tracker called “my hours”. I recommend you track all your time for a period of three to four weeks and then notice how much time is being wasted on low-value tasks. It will open your eyes on what you actually spend time on. In this way, you can rearrange your schedule and put in the high-value stuff first. 5. Stop being a victim and become a ‘Time Lord or Lady’. Apologies in advance, but I’m going to be blunt in this last tip. Knock off the whingeing about not having time. You are the business owner, and you’re in charge. Stop doing the stuff that gets no results and focus on the things that do. Invest your time in the things you want to do and the things you have to do. Reorganise and take control and stop being a victim. There you have 5 ways you can make the best use of your time as a business owner. If you’re mature age and about to start a business, you’ve now probably got an inkling of what other business owners run into, and you can start off right, and never fall into the ‘Time Trap’. Thanks, Hunter. That is very useful. Is Lack of Time Crippling You? There is no one silver bullet solution to time trap problems. Rather, it is a matter of steady, incremental continuous improvement. Improvement will take off the pressure being felt. As Hunter suggests, take these steps, and invest in your time so it adds value to your business.. If you would like to have a chat with me about the tools I use to help businesses create time in their business, book a Strategy Consult here. Are you Assuming Next Year is More of the Same? What are you doing this month to reinvent your business? 2018 is only just around the corner. It’s kinda crept up on us, unobtrusively hiding itself in the shadows. But the Christmas lights will soon bring it out of the shadows, and it could overwhelm you before you’ve prepared for battle. It is time to start thinking about what’s going to happen next year in and with your business? Have you thought about it? What do you hope to achieve.? What profit are you planning on achieving? If you don’t have an objective, you can’t be accused to failing to achieve it! The business that has nowhere to go will get there! But I’m sure that’s not really what you want. So let’s start thinking about where you want to be at end of next year, and then we’ have a look at some basic steps you might want to take. Now I’m not talking about a full-blown business plan, but rather a few practical steps that might make 2018 more of a path to the future, than a voyage into the unknown. And we also have to look at the infrastructure you need to get there. But first, what’s the ground you’re standing on like. You can’t do a high jump from marshy ground. You have to make sure of the ground you are launching from, before lifting off. Do you really know, to a reasonable degree of accuracy, what the state of your business is at this very moment? Is your business like that, you don’t know where you are, how you are travelling, or even whether you are heading in the right direction? Without context, and a clear path to follow, it’s easy to feel like you are driving in the fog. People need to see where they are, where they are going, and how they are going to get there, so they can relax. Dr. Greg Chapman reckons “Understanding where your business is and where you want it to be is the first step in planning.” I disagree. That is two steps, not one. You can’t properly address the “Where to” if you don’t know and understand the lift-off point. Sound information; i.e. data plus analysis, is necessary if you want to set achievable goals, and know how you can realistically achieve them. So to the next step: Where to? Where do you want to be by this time next year? Is it profits? Cash in the bank? Market share? Decimating the competition? I can’t tell you that, but you can, whether it is dreaming in the early hours of the morning, or hard planning session with your team. Do you want to turn your business into a profit machine, a profit machine that gives you the returns you seek, the payback you dreamt about when you started your business, the respect from your peers that say this bloke knows what he is on about, he knows what he is doing, he is a success? There is a big difference between having a picture in your mind about what you want to achieve with your business and being able to translate that picture into words on a piece of paper. I see it all the time when I run business planning workshops; getting small business owners to be clear on what they want to achieve with their business is difficult. They toss around vague terms like “be profitable”, “success” and “being successful” with gay abandon. But what do they really mean? What is success? How much profit? By when? 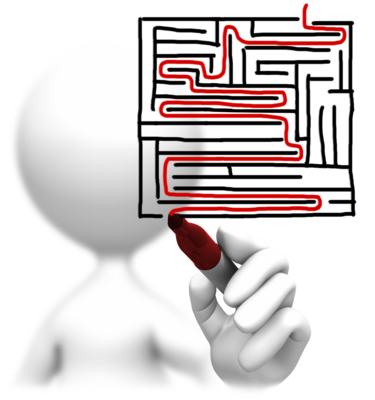 One of the functions of a vision is a “guide to decision making”. In fact, it is the foundation on which you base all other decisions. The fastest and surest way to achieve you vision is to be able to think through that vision clearly and correctly, and write it down. Articulate it. Then you will make clearer and more useful decisions. All the strategies and plans in the world won’t help if you have not laid the foundation for them with clarity on what you are trying to achieve. So it is worth spending some time thinking it through and achieving that clarity. Most people don’t. They are even uncomfortable in trying to do so. They come up with a form of words and move on to the more detailed work; specific goals to achieve that unclear vision, specific strategies to achieve those specific goals to achieve that unclear vision. Some foundation! No wonder so many small businesses flounder and go around in circles. Their decision making is flawed from the start. There is a second facet to this issue, and that is if you have no clarity about where you are going, and what you are trying to achieve, then it is hard to identify what is holding you back. And if you can’t identify what is holding you back, how then can you remove that impediment? So how can you obtain that clarity? • What kind of business do we want to be? • What will the business be like when we achieve the Vision? • What do we want people to say about us as a result of our work? • What values are most important to us? • What will be the key characteristics of my business in x years’ time? Step 2 - Then, and this is designed to really loosen the shackles of the mind, undertake an ‘imaginary journalism’ exercise: Imagine you are a journalist writing an article. Create a story vividly describing the successes you and the business will have achieved at some future time two, three or five years from now. Have a bit of fun with it; this is when you can write with jolly impulsiveness. Liberate your hopes and dreams. Step 3 - The hard work starts. Convert that journalistic licence into a SMART vision. Specific – the beginning of clarity. Measurable – if you can’t measure it how will you know your progress to its achievement. Achievable – What you are trying to achieve should be a stretch, after all its part of your dream, but dreams beyond reach fail to inspire for very long. Relevant – you are in the wrong business if your vision is not related to the business you are in. Time-based – Hey, you want to achieve that ‘success’ but when? Remove the haze from what you are trying to achieve. Clarity of your vision is your foundation for the future, leading to better decisions and helping you remove the impediments to your progress! Do that, and you will be ready to turn the corner into 2018, so that next year is not just more of the same. What is the "Right Price" for your Product or Service ? That question tantalises all of us running our own business. Do you actually decide your prices through a well thought out price strategy (the sensible, but usually unused approach), or gut feel? I’d bet the latter! Let’s see if this will help you. In my previous posting based on the “personal reflections on pricing” of Per Sjofors, Founder/CEO of Atenga Inc. I looked at the problems arising from not having a proper strategy, and using a “simplified” approach. The chances are that is what you are using. Pers suggest price-savvy companies use a more sophisticated pricing strategy - an optimized pricing strategy. In the context of pricing, this is what it means: The price of your product or your service provides you the opportunity to capture a portion of your customers’ willingness to pay. When your pricing strategy is optimized, you make the best use of that opportunity - you are capturing the maximum possible of that willingness to pay. Let’s move on to look at how Pers suggests you might use these to optimise price levels. The price of your product or services is a value statement. In fact, it is the strongest value statement you can make. It is the price itself that makes the value; the exclusivity of the brand is generated and maintained by the high price, and the high price is a strong indicator of quality and design of the product. Even if the manufacturing cost, including cost of exclusive raw materials, of a Prada handbag may be 3 - 5 - 10 times that of a “generic” nonbranded handbag, it is still the price that makes up most of the value it generates for its buyers. So how can you tie this into optimized price levels? Here is how: Of course, there are people, many people, who can’t afford a $4,000 handbag. At the same time, there are people who can afford it but believe the price is ridiculously high and others, not very many, I would guess, who think the price is not high enough, does not provide enough exclusivity and therefore value. And this is the trick with optimized pricing. At any given price you set, a number of prospective buyers will simply say they cannot afford it; a number of prospective buyers will say they just won’t buy it, and, maybe surprisingly for some readers, some will say it is not high enough, does not message enough of a value and quality, so they won’t buy for that reason. This is all about psychology of pricing. It’s based on how we humans make buying decisions. And we are all different. You get what you price for: The price of a product or a service is the strongest message of that product’s or service’s quality. It sets the buyers’ expectations of quality. So the price becomes either the driver for a company’s business strategy or market position. The price needs to be set in full support of that business strategy or market position. Any discrepancy will alienate customers. You know that pricing is more than just a number, as Pers suggested in the previous post. It is process and structure. Its tentacles reach to almost every nook and cranny of your company; sales, product marketing, production, product management, finance, executives and maybe even to the board. And I’m sure that if you see a mountain of things to do to get your company into optimized pricing, not only do you need it the most, but the sooner you start the better. And of course, you’ll start small. Maybe just take 10 or 20 of your products. Have your product management categorize these products into A - B - C - D categories. A for totally unique products, D for totally commodity products. B and C for in-between. Then for A products you simply stop all discounting. For B products you lower the allowed discount rate. You have your product management work on unbundles for the A and B products. You may want to try to increase price for them, and increase sales commission too - but just for the A products. Devise a good-better-best strategy for these products. Introduce price imaging - maybe with bundles. You look at the D products with the view of “are they strategic?”, “can we further reduce cost?” and “are we making enough money on these so it makes it all worthwhile?”. If they are not strategic or you are not making enough money on them, ask yourself why you still want to sell them. 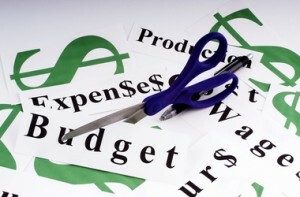 If you decide to - what can you do to reduce cost? As you follow the results of these 10 or maybe 20 products, I can guarantee that you’ll be astonished of the results. It will add to your bottom line so that you gain more resources to continue the price optimization; categorize more products; generate more un-bundles and bundles; train your salespeople on selling without discounting; invest in research to discover buyers’ true willingness to pay. Eventually you probably will need to recruit a person to run the pricing process in the company, and now you are really in price optimization happy-land and you realize that your revenue growth will double and your profits too - compared to when you started out. Thanks Pers. Now I challenge you to trial his A, B, C, D process. Let me know the results. Would you like a hand to improve your pricing? When clients approach me for coaching, so often, they are troubled by their profitability, or lack of it. Their pricing strategy is usually simple, and not differentiated from the competition. What really is a pricing strategy? “Almost every company chooses its customers. It can join the race to the bottom, or it can distinguish itself in some way, and serve a market vertical willing to pay a higher price for more value. Pricing is more than just a number. It is process and structure. Its tentacles reach to almost every nook and cranny of your company; sales, product marketing, production, product management, finance, executives and maybe even to the board.” Per Sjofors, Founder/CEO Atenga Inc.
My mantra is that it is not the volume of sales that’s important in determining the profitability of your business, but the volume of Gross Profits. And that will depend on your pricing strategy. Most small and medium businesses I know don’t put much rigour into their pricing strategy, yet it is so important to their profitability and cashflow. In his “personal reflections on pricing”, Per Sjofors discussed pricing strategies, and various options for optimising price. I have posted a number of times on pricing, and the links to these blog posts are given at the end. I found these “reflections” very valuable and have endeavoured to give you an abridged version here. Every company has a pricing strategy. It may be simple like adding a fixed margin to the cost. It may be pricing based on a competitor’s price list. Or, it may be something more elaborate. Simple pricing strategies have advantages. They are easy to understand, they are easy to implement and it does not take a lot of company resources to develop, maintain and communicate them. But they also have some serious flaws; they reduce the company’s sales level, they leave money on the table, they accelerate commoditization. Overall they decrease a company’s ability to compete and grow. In short, companies with simple pricing strategies are never the market leaders; they are nearly always the underdogs. They always struggle, never having enough resources for sales, marketing and product/service development. Never having enough resources to innovate. They struggle with profitability. In fact, price-savvy companies are usually the market leaders. They are the companies others aspire to become, the companies who earn the most money and grow the fastest. They are the companies with resources to innovate. And those are the companies that generate the highest shareholder value. So if there is a better way to price, what does it look like? These price-savvy companies use more a more sophisticated pricing strategy. An optimized pricing strategy. In the context of pricing, this is what it means: The price of your product or your service provides you the opportunity to capture a portion of your customers’ willingness to pay. When your pricing strategy is optimized, you make the best use of that opportunity - you are capturing the maximum possible of that willingness to pay. • influences sales compensation and sales training. Let’s look at some pricing options. The pricing structure is key to an optimized pricing strategy. As an optimized pricing strategy is built on various tactics and strategies that increase customers’ willingness to buy and willingness to pay. Unless the pricing structure supports these actions, companies simply cannot do these, and therefore cannot use price to influence willingness to buy and willingness to pay. They end up leaving the customer in control of the company’s pricing. Per suggests six tools you can use. For just about any item in the price list, having a good-better-best offering allows a company to capture buyers with different needs and different willingness-to-pay levels. It simplifies sales and enables a salesperson to direct a customer to “lower” level of offering instead of giving a discount. But the good-better-best structure has other benefits too. There are always customers who want “the best,” and they can be served here with the “best” offering. And also, the way price imaging works (see below for more details) is to frame the “better” offering to appear more affordable. Another key element of the pricing structure is bundles and unbundles. In fact, in some cases the good-better-best strategy is just that, different bundles of the same offering. The importance of unbundles is, just like with the good-better-best strategy, these unbundles allow a salesperson to offer an unbundled offering instead of giving a discount. So what is an un-bundle? Almost everything we buy is a bundle of some sort. Unbundling splits these apart, and prices separate components separately. Unless the pricing structure supports this unbundling, where there is a line item for the device with and without the program, the salesperson has no choice but to give a requested discount - and this, of course, affects the company’s profitability. But also, this sets a long-term precedent for continued discounting to close every deal. Another key element of a pricing strategy is price imaging. We, as humans, look at different offerings and unconsciously compare them. Price imaging takes advantage of this fact. An effective way to increase the willingness to buy and to pay for a product or a service is to offer something substantially higher in price than the product you really want to sell, in the same category. As the buyer compares the two prices, the less-pricey alternative becomes, in their mind, more affordable and has greater price-value. A high-priced offering has another, longer-term effect. Items we buy often have a reference price. We “know” what a product or a service “should” cost. Above that reference price, willingness-to- buy and -pay decrease rapidly and substantially. By providing an offering at a substantially higher price, with unique features or functions, over time, it is possible to educate the buyers to the fact that the reference price is higher than they originally thought. Price imaging also works from the other side. By offering something really cheap, but with very limited functions and features, the relative value of what you really want to sell is increased, and so is willingness to buy and pay. But of course, this needs to be done in consideration of the marketplace and competition. Options are also part of the price structure. They provide important opportunities for up-selling. Once your customer has decided to buy your main product or service, he or she is already in “buying mode” and it is relatively easy to continue to add options, many times simply because options may add a level of convenience that, at the time, add considerable value to the buyer. If what you are selling is highly commoditized and there is a plethora of competitors with very similar products or services, one way to differentiate the offering is to price it differently. Introduce another variable into your price levels. This is makes it difficult or even impossible for a potential buyer to compare two offerings on price alone. Whatever (small) differentiator you're offering has becomes more noticeable and you will be able to capture a portion of the market that prefers just your pricing structure. But even with a differentiated pricing structure, the price needs to make sense to the buyer. Despite all of this, the good-better-best, bundles and unbundles, the price imaging, the options and a “different” price structure, the price structure also needs clarity. Some companies come up with elaborate and complicated price lists because they say it “hides” the true price. The companies believe they can fool their customers, and realize higher prices without loss of sales volume. This is completely wrong thinking. A price list that generates confusion in your customers’ minds has the opposite effect. A confused prospect rarely makes the buying decision in favor of the confuser. In my next post I’ll share Per’s thoughts on how to optimise your price levels, and a process and structure to do so. • Are You Making These Pricing Mistakes? 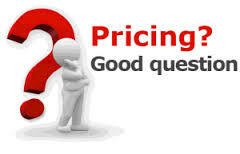 • Do you set your prices to maximise sales? • Are there hidden nuggets in your business? I don’t know that chasing profits will not harm you. Chasing profits can be a very stressful process. As can sustaining them. Because success takes more than 7 hours – not just a day, but many days, and many more hours per day. Becoming a debt-free, profitable business, or building one from the ground up, is a lengthy process. We start our businesses for many reasons; freedom, working for ourselves, time with family. Chasing dreams with nets of wonder. Naturally, the reality turns out to be very different - we become slaves to our own business. None of these dreams are achievable if our business is not profitable. Our dreams may never make it to the reality of the present. They can become permanent residences of the past. And the reality turns out to be so different because sustainable profitability turns out to be so elusive, fluttering like a butterfly and evading our grasp. • Develop a product that people want to buy. • Figure out how to sell it at a profit. • Push yourself and everyone else on your start-up team to get the first two things done before you run out of money. “If everyone can do it, you can’t make money at it.” By this we mean that in markets which are competitive with relatively easy entry and exit, suppliers can’t expect to make above the average return for long. In this case that means earning above the average wage, or for the less skilled, the minimum wage or even unemployment benefits. 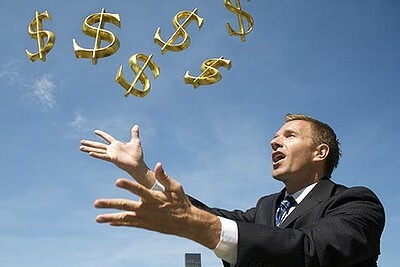 If activities are profitable then people will enter the market and drive down prices. At the extreme, you’ve entered "Commodity Hell." That's when a market for a product is so crowded, every product is virtually the same. Interchangeable with the competition. And the only way to get ahead is to slash prices until the pain of profit loss squeezes either you or those competitors out of the business. Without profit, it's hard to justify a business' existence. Even a non-profit works on a system of profit. Because profit is not the ugly word it's painted out to be. Profit is merely the sum you earn that allows you to keep doing what you love. Helping others in the process, while realising those dreams. Business without profit is not a business any more than a pickled onion is a chocolate. We have to look at what you have control over, and what you don’t. Which leads me to SWOT; Strengths, Weaknesses, Opportunities and Threats. First, let’s look at the elements you can control, those things internal to your business. They are your Strengths and Weaknesses. Dr.Dr. Greg Chapman identifies five keys you need, which, if you have will be strengths, and if you don’t, will be weaknesses which need remedying. 1. A Business Plan to drive your business growth. See “What do you want your Business Plan For?” for more detail. 4. Motivation to get the most from people within your business. 5. Owner Accountability and discipline with a business that’s run by reports. Protecting your profits begins with knowing and attending to the correct, critical numbers in your business. The key question business owners have to ask themselves is if they know what is happening in the business from the information they collect. It isn't about how much you turnover, it is about how much you make. Most businesses can tell you how much they turnover, but few can tell you how much profit they make. And that is why profit is so elusive! Second, you need to consider your external environment. That is where the Opportunities and Threats come from. While not fully outside your control - research into your marketplace, and competitors is something you can and should do - you have less control over what happens outside your business. • Expand/Reduce the size of your customer base – e. g. natural growth, demographic shifts, rising incomes, economic conditions. • Give new avenues for customer access (or remove them) - new ways of ‘packaging’ your product, new opportunities for promotion, alliances & networks. • Increase/reduce the customer appeal of your value package - compared to those of the competitor. • Exploit a weakness or blunder by a competitor/your business - inability to respond to your initiatives. Profit will definitely be elusive if you allow a Weakness to collide with a Threat. The first time I read that comment, I thought about how true it is. But it also reflects something that is missing in most of our marketing efforts. The quote is from Sean D’Souza, a New Zealand marketer I’ve been keeping an eye on for some years. He makes an important point. We, as sellers of products and services, worry all the time that if we charge too much, the buyer will turn away. Let’s face it, prospects step back from a buying decision when they have doubts in their mind about the purchase, objections if you like. We haven’t convinced them that what they are going to get is going to make a real difference to them – and that’s what value is. It makes a positive difference. They are better off for making the decision in our favour than if they hadn’t. But I think the point made is very real; our prospective customer is always making a possibly unconscious calculation in his/her mind – is it value? Business is about providing value to the customers. And that value can be determined only by the customer. The greater the perceived value you present, the greater will be the desire for your offering. People seek value. Value is not a fixed number. It is a subjective relationship between the thing you are selling and what people perceive its worth to be. The greater the value relative to the price, the more likely people will respond to your offer. Solving problems creates value too. And the more pressing the problem the more value a solution has. Also, the more severe the problem, the greater the value the solution has too. The key is the perception of value. Free has no barrier. And hence no value. 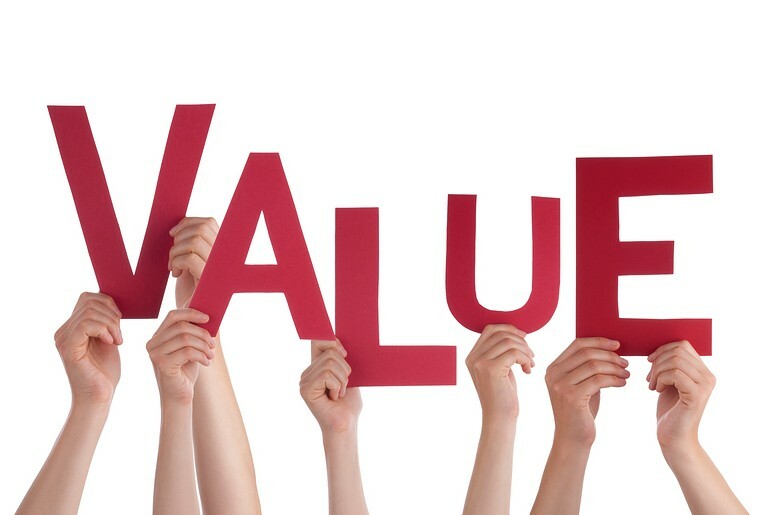 The goal of your marketing must be to create a greater perceived value of your product than the price you are asking. We must bring value to the transaction. There is a role for discounting, and that is to acquire a customer. You make your money from repeat customers, increasing the size and frequency of their purchases as they build increasing trust in you and your products/services. There’s no point making the first sale, if you can’t make the second. However, there is little benefit in so doing if all that is making them loyal is low margins. Yes, use discounting to acquire customers, but not to keep them. I’ve written many times on issues arising from discounting. And then there is the problem of objections. Objections are those doubts that lodge themselves in the prospects minds about your offering. The greater the size and number of objections murmuring away, the less perceived value there is. So, you have to remove them. People want to avoid risk. People pursue gain, but the urge to avoid loss is more powerful because it works on a more basic level. In direct marketing for example, people usually can’t see you or the thing you’re promoting before they part with their money. So there is always a level of distrust and suspicion you must overcome. People need to justify decisions logically. While people make emotional decisions, they justify those decisions with logic and facts. You should always give people the appropriate justification for making a purchase. Value is related to information. Value comes from relevant information. Increase specificity -- By increasing the specificity of the message, you can better communicate value. In the absence of relevant information, price dominates. In business, every single thing we do is about educating our customers in some way so they trust us, enough to buy from us. Facts educate our customers. A prospect tells you that your price is too high for two reasons: you haven't built up enough value or you haven't shown them how your service can satisfy their need. Business is the activity of creating value. That is what you get paid to do. Customers do not want your products and services - they want what those products and services will do for them. Business people must learn to become value creators because those who understand value best will prosper and those who do not will fail. When clients approach me for coaching, so often, they are not getting the clients they need, the right clients. Eight times out of ten this comes down to not knowing how to provide value their customers recognise, and covet. An interesting conjunction of two business stories highlighted an issue that businesses often overlook. It is so easy to become focussed on price, and the competition, without looking at other aspects of the business model that also affect sustainability, and profitability. My mantra is that it is not the volume of sales that’s important in determining the profitability of your business, but the volume of Gross Profits. The second reaction, and usually from more savvy businesses, is to look at how they can increase value. After all, people buy on the value they receive from their purchase. And yes, discounting does increase value, but a better strategy is to look at how you can add value, without cutting your margin. There is a third way to maintain or even increase your margin, and do so while cutting prices. Now the two stories; yes, my examples are all major businesses, but that doesn’t mean the principle espoused cannot be applied to your business. It can. The industries are retail, in the form of Aldi and Amazon, and mining, specifically Fortescue Minerals, to which I’ll add some direct experience I had in a similar exercise. But that is not what I’m going to discuss. As you shall see in a moment, I’m not talking about incremental reductions, but significant reductions - I’m talking about real cost reduction. The source of this story is the online newsletter Smart Company, and an article by Kevin More, “Why Aldi and Amazon are not Discounters”. When it comes to price, we often hear some retailers referred to as “discounters.” Retailers like Aldi, Lidl and Amazon. But here’s the thing. They’re not discounters and don’t think of themselves as discounters. Firstly, Aldi and Amazon have a fiercely won and maintained a low “cost of doing business”. There are as few costs as possible between the receiving dock at the warehouse and the trolley in the store, and this includes their head office. Amazon chief Jeff Bezos is famous for his phrase, “your high margins are my opportunity”. He didn’t set out to sell groceries and electronics but the margins he saw were so attractive he had to compete. And it’s not just retailers that have high embedded cost, but major branded manufacturers too. What he actually meant by the phase “your high margins are my opportunity” was that the combined high costs of many suppliers and retailers allow Amazon to offer either its own products vastly cheaper or branded products a lot cheaper. Discounts in brand marketing means lowering the price of a branded item from the level the manufacturer would normally like to sell at and the shopper would normally expect to pay. Aldi and Lidl have exactly the same philosophy. They aren’t discounting; they just operate on a lower cost of doing business and are supplied by companies with a lower cost base. When you combine these two low cost bases, retailers like Aldi and Amazon need lower cash margins and so offer lower cash prices to shoppers. Retailers have to apply money from today’s profits to protect future profits. They need to put money into new lower cost ways of doing business to allow them to sell at lower prices and still make a return for shareholders. The source for this story is an article in The Australian Business Review by Stephen Bartholomeuz, “Fortescue’s Great Achievement”. Five years ago, when the iron ore price “crashed’’ to $US90 a tonne, Fortescue Metals was in crisis. Today, after a year where the price averaged just under $US70 a tonne, Twiggy Forrest’s group reported a $US2.1 billion profit. As is now well understood, the core of the explanation for the transformation of Fortescue from an overtly-leveraged and vulnerable minnow into a genuine third force in the Pilbara with a stable balance sheet has been its performance on costs, coupled with an increase in iron ore volumes from the 55.8 million tonnes it shipped in 2012 to the 170.4 million tonnes it shipped in the year to June. From a starting point of C1 costs of more than $US48 a tonne the group has steadily and significantly shifted itself down the cost curve to the point where, in the year to June, C1 costs averaged $US12.82 a tonne, adding another $US445 million to the $US2 billion benefit it gained from reducing costs in the previous financial year. In June this year its C1 costs — which represent the “direct” production costs of iron ore — were $US12.16 a tonne. Note the 75% reduction in the direct production costs of iron ore! Now for my mining example. Some years ago, I was asked to join a team tasked with reducing a major mine’s operating costs by 22% in cash terms. This was a strict guiding rule for the team; no fancy accounting tricks. The client was looking for real cash savings, much like Fortescue, except that we looked at more than the “direct” production costs. Real savings were being targeted across the board. The team was divided into small groups that looked at everything from the mining costs, to travel, vehicles, and the costs associated with the mining town which supported the operation. All costs were on the table. I must admit I was dubious that this could be achieved, but it was. Much like the Fortescue example, the outcome achieved made a significant difference to the survival and prosperity of the mine. • Discounting is not a lower-cost way of doing business. • Adopt a “lower cost of doing business” business model and challenge all high, embedded costs. • Significant cost reductions can be achieved, but it requires detailed study. • It also requires working with suppliers who have a similar “low-cost” approach. • A lower-cost way of doing business allows you to sell at a lower price, and still give shareholders a return. • You will need to apply money from today’s profits to achieve a lower cost way of doing business. You can build a low-cost business model. 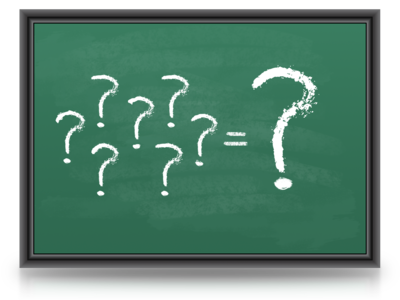 The key questions are – how much do you want to reduce your cost of business, and why? What do you want to achieve? What difference will it make to you? If you can articulate your response to these questions, we should have a chat about HOW you might do that.